King County has agreed to ban solitary confinement of juveniles in all King County detention facilities, with some specific exceptions, according to a settlement signed today by Judge John C. Coughenour of the U.S. District Court for the Western District of Washington. The settlement was negotiated in response to a lawsuit brought by four children in October 2017 who were imprisoned at the Regional Justice Center (“RJC”) in Kent, Washington, and challenged King County’s policies and practices of holding children in long-term solitary confinement and denying adequate educational services. Under the settlement, King County agrees to a ban on solitary confinement except in very limited circumstances and then for only short periods of time. Solitary confinement may not be used for disciplinary or punishment purposes. King County also agrees to work with a monitor who will provide regular reports – to the County and Columbia Legal Services, look into alternatives to solitary, and review any transfer of a juvenile to an adult detention facility. King County will work with Columbia Legal Services to draft a new Solitary Confinement policy that includes, among other elements, a requirement that when youth enter solitary confinement, a mental health professional and a parent or legal guardian are notified within eight hours of placement. King County also agreed to compensate the four youth for the injuries that the County’s use of solitary confinement had caused them. King County has agreed to pay the four youth $215,000 to be split evenly amongst them as well as $25,000 in attorneys’ fees. The Plaintiffs were children at the time they were charged as adults and detained at RJC, an adult facility, awaiting trial. None of them could afford bail. They have each been held in isolation for days and sometimes months, often without explanation, and typically spent at least 23 hours a day locked in small, stark cells absent any windows or natural light, sometimes with no more than 15 minutes out of isolation every three days. Children held in isolation have little to nothing to do in their cells: no meaningful human interaction, little to no educational activities, no music or television, little access even to reading or writing materials. When allowed out of their cells, any “recreation” takes place alone in an empty, concrete pen. Potentially dangerous for anyone, solitary confinement is especially harmful for children, who are still developing physically, psychologically, and socially. Isolating children so that they have minimal meaningful social contact causes trauma, depression, anxiety, and psychosis, and increases the risk of suicide and self-harm. C.S., one of the plaintiffs, was prescribed mental health medications because he is clinically depressed, while J.R., another plaintiff, was sent by authorities from RJC to King County Jail because they believed he might be suicidal. He remained in isolation. According to a recent report issued by the King County Prosecutor’s Office, a disproportionate number of children King County charged as adults are children of color – 86% in 2016 and 83% in 2017. The same report acknowledges that most of the children King County holds on adult charges who are subsequently convicted receive a juvenile sentence. Many of the children are persons with mental or physical disabilities, have suffered physical, emotional, or sexual abuse, and have experienced severe poverty or homelessness. 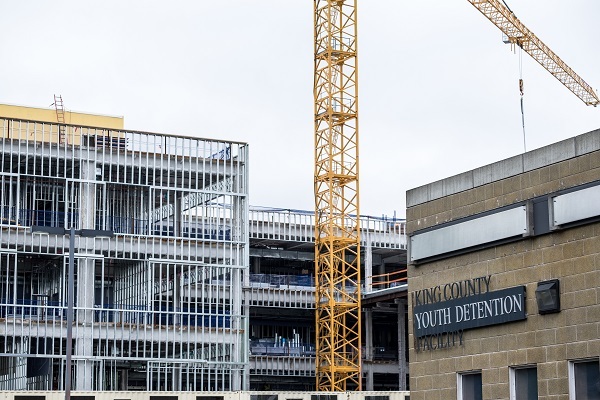 Two weeks after this lawsuit was filed, King County Executive Dow Constantine signed an Executive Order which states that “by March 1, 2018, no youth will be housed at [RJC], except under emergency situations,” but failed to address major flaws in the way that King County continues to treat children caught up in the criminal justice system. On December 11, 2017, the King County Council banned solitary confinement for minors at the RJC and King County Jail. The County took these steps in response to the filing of the October 2017 lawsuit. As a result of the lawsuit, King County no longer houses children in its adult facilities and has pledged to not do so in the future, absent exceptional circumstances. In addition to financial compensation, the settlement includes additional elements that the County did not address in its prior responses, including specificity regarding the use of mental health services and the involvement of family members to limit the use of isolation. Most children are locked up at the RJC as a consequence of Washington’s “auto-decline” law which grants prosecutors, not judges, the power to unilaterally determine if children should be automatically transferred to adult court. During the 2017 Legislative Session, Columbia Legal Services fought to help pass SB 6160, a bill that restricts the use of “auto-decline” by reducing the number of offenses that were added to the auto-decline list during the now-debunked “superpredator” hysteria of the late 1990’s. Columbia Legal Services has serious concerns with other parts of this bill and will continue to advocate for changes. King County and Kent School District also unlawfully denied children held at RJC adequate educational services – the vast majority of whom are children of color. This settlement also resolves an administrative complaint filed with the Washington State Office of Superintendent of Public Instruction against Kent School District, the entity obligated to educate youth at the RJC with King County’s assistance. Unfortunately, as laid out in that complaint, Kent School District failed in those duties. It assigned a single instructor for all children housed in three different housing pods. Children in the general population wings typically received no more than an hour a day of class instruction, and children in isolation received at most a few minutes of individual instruction through a closed and locked steel cell door. King County and Kent School District provided no special educational services and did not comply with existing Individual Education Programs (IEPs), in violation of federal and state laws. Kent School District has agreed to reform its policies and procedures regarding the educating of youth held at the RJC and has agreed to pay the four plaintiffs $25,000 to compensate them for the injuries that they suffered as a result of the deficient education the youth received while housed at the RJC.